CA Sudarshan Agrawal has been in the profession of coaching CA aspirants, ever since he became a qualified Chartered Accountant in the year 1995. He has been mentor to thousands of students in past two decades. He is credited with producing maximum number of rank holders, including AIR -1 (IPC & Final) from Eastern India. He is known and accepted for his communication skills and student friendly approach in teaching. His two decades long experience and techniques ensure that all students, irrespective of their academic background, feel comfortable in the classroom. 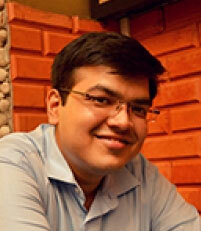 He is also known as one of the first few to use technology for imparting lessons to students in last one decade. In response to popular demand from students in cities other than Kolkata, he has been offering video classes to students across India for the past three years. The classes in Kolkata are recorded using latest available High definition technology and are sent to centers across India. The classes are designed in such a way that all possible queries and doubts are taken up in the lectures. In case there are any such academic query of the student, there are various means of handling the same like whatsapp, dedicated query portal, direct interaction with sir etc. As part of the study Sir insists on practice at home. The detailed solution to all assignments for home is provided to the student upon completion of each topic.